Some time ago I posted here about my Fuller line and how it seems to lead back to Edward Fuller (abt 1575-1621) of the Mayflower. That line has a couple weak links, namely Loring Fuller (1797-1863) and his father, Jethro Fuller (bef 1770-1821). More recently a distant cousin wrote to me because of that post. The cousin also believes our line goes back to the Fullers of the Mayflower and would like to prove that once and for all in order to join the Mayflower Society. I would be delighted with proof. The cousin gave me a few pieces of information I didn't have before. I knew that Jethro Fuller's wife was named Siba Kelsey, but I had no other information about her. The cousin provided a photograph of her gravestone, here, in the Smith-Dunbar Pioneer Cemetery in Parma, Monroe County, New York. This prompted a correction to some information I wrote about in the earlier post linked above. My research had Siba's son Loring Fuller and his family located in Nichols, Tioga County, New York, according to the 1830 US Federal Census. But there's also a Loring Fuller and family in Greece, Monroe, New York, in the 1830 census, information I hadn't found before. Greece is next to Parma, where Siba Kelsey Fuller's buried, so the Fullers in Greece, not the ones in Nichols, are clearly the ones in my direct family line. Siba's maiden name on her gravestone is spelled Kelsy, rather than Kelsey, which is why I hadn't found her grave before. Most compelling to me was that the stone also gives her death date, April 14, 1838. And her age, 63. Simple math provides a birth date between April 14, 1774, and April 14, 1775. From the Barbour Collection of Connecticut Town Vital Records. Using those dates I found Sibe Kelsey, born August 16, 1774, in Killingworth, Middlesex County, Connecticut, daughter of Ambrose Kelsey (1747-bef 1749) and Jemima Griswold (1747-unk). I don't have conclusive proof that this is the Siba Kelsey who married Jethro Fuller, but despite the variant spelling of her name, I'm sure she's the same person. Sibe Kelsey of Killingworth, Connecticut, is the only Siba Kelsey of the right age and geographical area who fits. 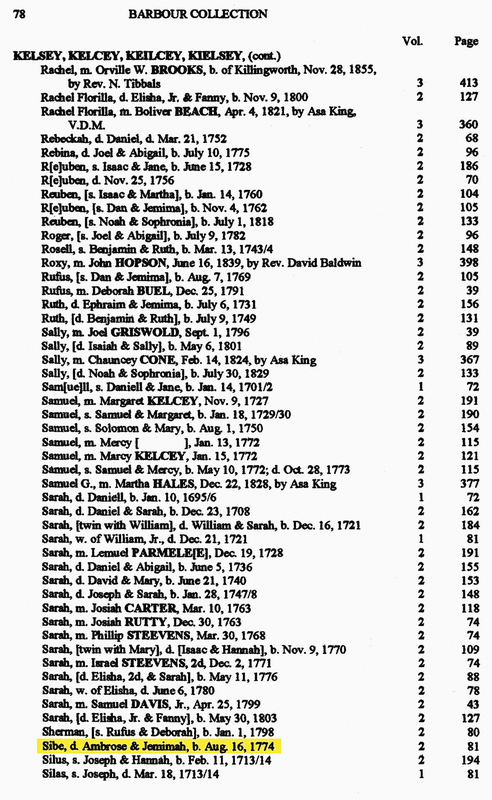 The Kelsey family of Killingworth, Connecticut, is extensive and well documented for many generations. Siba's great-great-grandfather was William Kelsey (1600-1680), who helped found Cambridge, Massachusetts, in 1632; helped found Hartford, Connecticut, in 1636; and helped found Kenilworth, later Killingworth, Connecticut, in 1663. Siba's ancestry includes Griswold, Parmele, and Hull lines. One line leads back to Robert White (abt 1558-abt 1617) and Bridget Allgar (abt 1562-aft 1605), whom I trace descent from in several additional ways. Other descendants of Robert White and Bridget Allgar include Frederick Law Olmstead (1822-1903), Lucille Ball (1911-1989), Joseph Smith (1771-1840), Donny Osmond (b. 1957), Marie Osmond (b. 1959), Shirley Temple (1928-2014), Wilbur Wright (1867-1912), Orville Wright (1871-1948), Emily Dickinson (1830-1886), Jodie Foster (b. 1962), David Hyde Pierce (b. 1959), Ulysses S. Grant (1822-1885), Millard Fillmore (1800-1874), John Brown (1800-1859), Richard Gere (b. 1949), Gerald Ford (1913-2006), Samuel Colt (1814-1862), J. P. Morgan (1837-1914), and Ellen DeGeneres (b. 1958), to name a few. They're all my cousins. So you see I have plenty of subjects for my series of blog posts on "My Famous Relatives," several for my series on "My Gay Relatives," and a couple for my series on "My Musical Relatives." Let's see how many I actually cover.